On behalf of the organizing committee, we thank you for your participation in making the geoENV2018 conference a real success! We will be uploading some conference material, photos and so on in the forthcoming weeks. We will be making presentations in pdf form available from authors accepting to share them. We will be contacting all authors about this. Thanks again, see you at geoENV2020 in Parma! 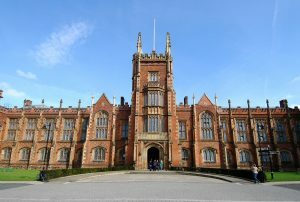 The drinks reception and dinner will be hosted from 7.30pm (dinner 8pm) in the Queens University Lanyon Building (Historic University Quad) Great Hall. Enter from the main Lanyon Tower door and foyer. See you there! A conference field excursion will be take place on Friday 6 July 2018: ‘Geology and the Games of Thrones’ with Geological Survey Northern Ireland (GSNI): £30 (numbers of participants are restricted to 30 due to coach size). The field excursion will leave Belfast at 8.45 am from Elmwood Avenue Belfast, (Elmwood Building/Geography) returning no later than 6 pm. The field excursion will offer a blend of fantastic scenery and an appreciation of how geology has formed the land and seascape of the North of Ireland. For Games of Thrones enthusiasts a number of the sites we will visit are used as sets for the HBO series. For more information please see the Giant’s Causeway and Carrick-a-Rede rope bridge websites. We urge booking your accommodation at your earliest convenience as demand for hotel rooms in Belfast surges during the summer months. ﻿Early Bird Registration has been extended to May 7﻿﻿th 2018. Authors with multiple submissions need only register once. Registration is open at https://2018.geoenvia.org/registration/. All authors have been notified of oral and poster abstract acceptance. Approval to present at geoENV2018 is conditional on author registration and full payment by May 15, 2018. Authors with multiple submissions need only register once.